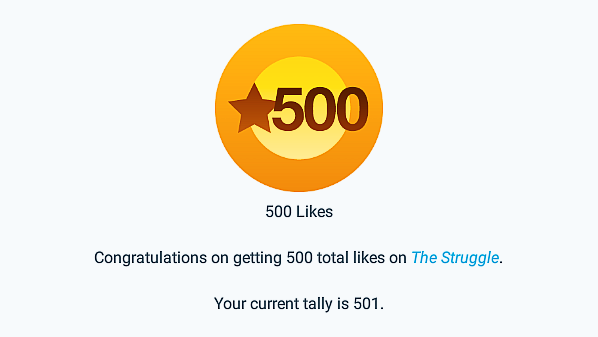 Achievement Unlocked: This Many Likes On The Struggle – Thank you to my viewers and fellow wordpressers! THE STRUGGLE BREAKS ITS PREVIOUS RECORD FOR LIKES IN A SINGLE DAY THANK YOU FOR YOUR SUPPORT THIS WEEKEND! THE STRUGGLE REACHES 1000 LIKES – THANK YOU FOR YOUR ENDLESS SUPPORT! Achievement: 500 Likes & Counting – Thanks!